The temple of doom is an outstanding divesite for divers that like lots of colorful fish and coral. The divesite consists of a large bommie that is roughly oval shape. The bommie has steep walls on which alot of colorful life makes its' home. 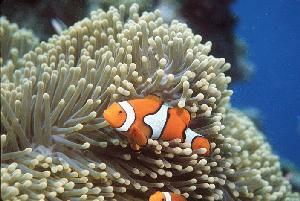 On the walls one will find soft coral, crinoids, fans, and many small colorfull reef fish. The top of the bommie is the best part of this fantastic divesite. The top of the bommie is a fantastic array of hard corals and small fish that inhabit the reef. The top of the reef is somewhat bowl shaped allowing the diver to enter and wander around in shallow water for a close-up view of the sea life. In the bowl shaped area of the bommie the diver will find schooling fish, lion fish, parrotfish, wrasses, wobbiegongs, trumpetfish, tangs, anemonies and thier attemdant clown fish, jacks, and triggerfish and many varieties of hard coral like plate coral and staghorn coral with many crinoids (featherstars) nearby.